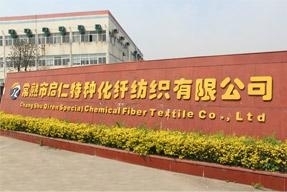 Our company is more than fifteen year history of professional nylon chemical fiber manufacturing enterprises. Company is located at No. 25, Guotai Road (Dayi), High tech Industrial Park, Changshu City Northwest, Jiangsu Province. To our company can go from Shanghai through the highway along the Yangtze River to Changshu north exit, Su Jiahang highway, Shajiabang Changshu (Changshu South) exit, also can take No 204 National Highway arrive at our company, Transportation is very convenient. Our company covers an area of 19976 square meters, has 6 professional production lines for producing nylon tows, nylon staple fiber and nylon monofilaments and polyester fiber, and has another 2 spinning production lines. Annual production capacity of about 12000 tons, industrial output value of over US dolla 65000000. My company perennial business products: nylon tows, nylon staple fibers and nylon monofilaments. 1, tow products mainly include: Nylon 66, nylon 6, dull, semi dull, bright, triangular, round type and flat type and cationic polyester tows; specifications from 0.5d ~ 90d with various specifications of the tows. For electrostatic flocking villi processing, and at the same time provide special specifications of the industry specific villi. Nylon tow product specifications: mainly used in the clothing fabric, sofa fabric, giving the fabric velvet feel; 0.5d, 0.8d, 1D, 1.3d, 1.5D, 1.8D and 3D application in garment fabric, packaging material, jewelry boxes, clothing racks and sofa decorative fabric, 5D, 6D, 9D, 13D should be for apparel fabrics and special needs, products of 15d, 22d, 35d, 60d, 75D and 90d, used in carpet flocking products. 2, staple products mainly include: nylon 6 and 66, dull, semi dull, bright, round, triangular, specifications have 0.8d - 60D. length can be according to customer needs. Products are used in cotton, non-woven fabrics, wool, carpets, polishing disc and so on. 3, the main products of monofilament are: nylon 66 and nylon 6, polyester, polypropylene and so on. Specifications 5D - 4500D with round and flat. Nylon 66 and 6 products are mainly used in tyre chafer, nylon sticking buckle belt, all kinds of net cloth; polyester products mainly used for sandwich mesh cloth, Geotechnical material cloth material; polypropylene fiber product is mainly used for all types of soil cement mixed cementitious materials, furniture, chair cloth and so on. The company is the first domestic production and research and development of nylon 66 and tow and staple fiber enterprises. Company to the development of the industry oriented, to domestic and international market demand based, timely, unique R & D nylon anti oxygen, light, flame retardant, antistatic and other new products. Strive to maximize meet customer and market needs. In the spirit of truth-seeking, innovation, win-win principle, may work together with all parties, Tongchuang brilliant. Address: No. 25, Yushan Town, Guotai Road, Changshou City, Jiangsu province, China.